BC OneCard patrons may borrow up to 5 items at one time including books, magazines, audiovisual items, audio/music tapes and CD’s. A library card from your home public library opens the door to public libraries wherever you travel – or stay – in British Columbia. Don’t leave home without it. Q. WHO is entitled to BC OneCard service? A. Any BC resident who can show a valid public library card. Q. HOW do I get BC OneCard? A. Take your home public library card and current ID into any participating public library in BC other than your home library and ask for a BC OneCard decal. Q. WHAT if I don’t have my home library card with me? A. You need it to sign up for a BC OneCard, so don’t leave home without it. A. 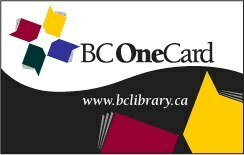 Use your BC OneCard at any public library in the province. At each library you will also need to provide current ID with proof of your contact information. Q. WHAT does the BC OneCard service include? A. It allows you to check out materials and use services determined by each individual public library. Check with each library for a list of what it provides. Check your library's website to see what you can use at your library. Q. WHAT if I need services and materials that a specific public library does not allow me to use? A. If you want more than the library offers BC OneCard customers, you may obtain full service by paying a non resident fee (at a rate set by each library). Q. WHERE do I return materials that I’ve borrowed? A. Return them to the library you borrowed them from, or to any participating BC OneCard library in the province – including your own library when you get home. Q. WHEN do I have to return the materials? A. The library you borrow the materials from will let you know when they are due back. Q. WHERE do I pay fines owing on books I borrow? A. Fines and charges on materials are payable to the library you borrowed them from. Libraries are unable to take payment or charges that accumulate on items borrowed from other libraries.